Christopher Jason Witten (born May 6, 1982) is an American football tight end for the Dallas Cowboys of the National Football League (NFL). He played college football for the University of Tennessee, and was drafted by the Cowboys in the third round of the 2003 NFL Draft. Witten ranks second all-time in career receptions and receiving yards by an NFL tight end, trailing only Tony Gonzalez. He became a three-year starter playing both linebacker and tight end, while helping his team reach the state semifinals three times. As a senior linebacker, he finished the season with 163 tackles (registering a career school record 450), nine sacks, two interceptions, five forced fumbles, three fumble recoveries and two blocked kicks. That year he received several accolades: All-American, All-State (also as a junior), USA Today Player of the Year for Tennessee, East Tennessee Player of the Year, Region Defensive Player of the Year and runner-up for the Mr. Football award. He had 26 receptions and 14 touchdowns on offense. He also played basketball, where he averaged 15 points and 12 rebounds per-game. After injuries impacted the depth at the tight end position, he was moved to the offensive side midway through the season. Although Witten didn't agree with the change and even considering transferring, he eventually came around and was used primarily as a blocker while he learned the position. He also started in his first 2 games. He started three games as a sophomore, registering 28 receptions for 293 yards and 2 touchdowns. As a junior he had a breakout year, setting school records for a tight end in receptions (39) and receiving yards (493) with five touchdowns, including one of the most memorable receptions in school history, a game-winning touchdown in the sixth overtime against the University of Arkansas. He received All-SEC (SEC) and Academic All-SEC honors after leading the conference's tight ends in receptions and receiving yards. Witten was selected by the Dallas Cowboys in the third round (69th overall) of the 2003 NFL Draft. Although the Cowboys had a first round grade on him, when their turn came in the first and second rounds, they selected cornerback Terrence Newman and Al Johnson based on team needs. Undrafted free agent Tony Romo was another rookie who also arrived in Dallas in 2003 and would go on to become Witten's teammate for the next 14+ years, as well as his roommate during future team training camps and travel games. Entering the league as a 20-year-old rookie, he started only seven of the fifteen games he played in, registering 35 receptions for 347 receiving yards and one touchdown. He broke his jaw against the Arizona Cardinals, after being hit by Ronald McKinnon and Ray Thompson, which required surgery to have 3 plates inserted to help the healing. He only missed one game (the lone game he has missed during his NFL career) and continued to play through the injury. Then-head coach Bill Parcells has always complimented Witten on his toughness. In 2004, Witten had a breakout season leading the NFC with 87 catches, which was also the 11th most in history by a tight end and a Cowboys team record for the position. He was selected to his first Pro Bowl, becoming a part of the Cowboys franchise's legacy of great tight ends that includes Jim Doran, Lee Folkins, Pettis Norman, Mike Ditka, Billy Joe DuPree, Franklin Clarke, Doug Cosbie and Jay Novacek. Witten finished sixth in the NFL with 66 receptions and became the first Cowboys tight end to have at least 65 receptions in consecutive seasons. He also had 757 receiving yards, 6 touchdown receptions and was named to his second Pro Bowl. Witten had a career year during the 2007 NFL season, breaking his own single-season Cowboys tight end record for receptions with 96 and becoming the first franchise tight end to reach 1,000 receiving yards in a season. He also was the third tight end in NFL history with 96 or more catches. On December 9 versus the Detroit Lions, Witten's 15 receptions tied an NFL record held by Hall of Famer Kellen Winslow Sr., for most receptions in a game by a tight end in NFL history. In the 14th game of the year, Witten became the first Dallas tight end ever to gain over 1,000 receiving yards in a season. Witten was also one of the NFL-record 13 Cowboys players selected to the Pro Bowl. Additionally, he made the 2007 All-Pro team along with teammates Terrell Owens and DeMarcus Ware. In the Week 9 game on November 4, while playing at Philadelphia, he made a 53-yard reception after losing his helmet. Witten made his 400th career reception in the Cowboys' Thanksgiving Day game against the Seattle Seahawks on November 27, 2008. He posted 81 receptions (13th in the NFL) for 952 yards, 4 touchdowns and was named a starter for the 2008 Pro Bowl. 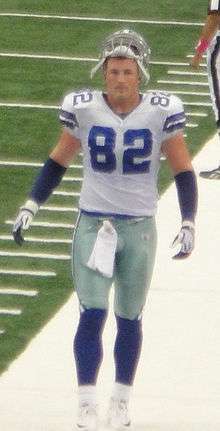 Jason Witten during the 2009 season. Jason Witten had another Pro Bowl season, making 94 receptions for 1,030 yards, and 2 touchdowns. He was also given the NFL Iron Man award. Witten banged his head on the turf after making a catch in Week 2 against the Chicago Bears. He was forced to miss the rest of the game with a concussion. In a Week 15 game against the Washington Redskins, Witten became the fastest tight end to make 600 receptions (125 games). He accomplished this with a 10 catch, 140 yard, 1 touchdown day at home. He received his 7th consecutive Pro Bowl selection when he was named as the starting tight end for the NFC. He hauled in 94 receptions for 1,002 yards and nine touchdowns for the 2010 season. Witten finished the season with 79 receptions for 942 receiving yards and 5 touchdowns playing in all 16 games. On November 13, 2011, Witten surpassed Ozzie Newsome as the tight end with the third most receptions in NFL history with 663. On September 16, against the Seattle Seahawks, Witten caught 4 passes for 58 yards. He finished the game with 702 career receptions to become just the second player in franchise history to reach 700+ catches (Michael Irvin has 750) and the third tight end in NFL history to do so (Tony Gonzalez and Shannon Sharpe are the other two). Witten became the fastest tight end to reach 700 catches, reaching the milestone in 145 games, Gonzalez took 154 games and Sharpe took 178 games. Witten also became the youngest wide receiver/tight end to reach 700+ catches with 30 years, 133 days. This record was later broken in Week 3 by Cardinals' wide receiver Larry Fitzgerald who totaled 707 career catches with 29 years, 23 days. His 58-yard performance gave him 7,977 receiving yards for his career passing Jackie Smith for fourth all-time in receiving yards among tight ends. After week 3, Witten passed Ozzie Newsome for third place all-time in receiving yards among tight ends. In week 8, Witten caught a career-high 18 passes for a total of 167 yards. This is also a record for receptions by a tight end; the previous record of 15 receptions was set by Kellen Winslow Sr. in 1984. On December 26, he was selected to his eighth Pro Bowl. For the second time in his career, Witten was nominated for the Walter Payton Man of the Year Award, this time winning the award and the $25,000 donation to his charity. On September 15, Witten surpassed Shannon Sharpe with the second most receptions as a tight end in NFL history. His three catches during the game against the Kansas City Chiefs brought his total to 817. In the last game of the season against the Philadelphia Eagles he had 12 receptions for 135 yards. He finished with 73 receptions, 851 yards and 8 touchdowns. Witten in 2015 Pro Bowl. 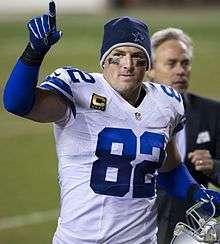 In a game against the Houston Texans on October 5, Witten became only the third tight end with 10,000 career receiving yards, joining Shannon Sharpe and Tony Gonzalez. That season the Cowboys emphasized the running game and although his receiving production declined, his blocking was noticed while helping Demarco Murray lead the NFL in rushing. He finished with 60 receptions for 654 yards and 5 touchdowns. During the season, he was asked to be more involved in the blocking than usual, because of the team playing with 4 different starting quarterbacks with varying degrees of knowledge of the offense. He led the Cowboys with 77 receptions for 713 yards and 3 touchdowns. Witten resides in Westlake, Texas, located in the Dallas–Fort Worth Metroplex, with his wife, Michelle, an emergency room nurse at Dallas' Parkland Memorial Hospital, and their children, C. J., Cooper, Landry, and Hadley Grace. Witten's wife gave birth to a daughter in late 2012. The couple chose to keep her name private from the media but it was later revealed that her name is Landry. Their second daughter, Hadley Grace, was born on November 21, 2014. 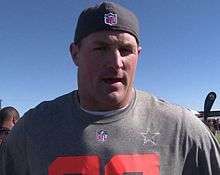 Witten is a Christian, and appears in a video on I Am Second in which he talks about his faith. ↑ "Witten on Pro-Football-Reference". rbref.com. Retrieved 2007-12-19. ↑ Taylor, Jean-Jacques. "Dez Bryant has a role model handy". ESPN.com. Retrieved 26 October 2013. ↑ "Now Among Game's Greatest, Tight End Wasn't First Choice For Witten". Retrieved February 19, 2016. ↑ "Sturm's Cowboys analysis: Defenses still can't stop Jason Witten". ↑ "Ellis Helps Cowboys Stretch Pro Bowlers To 13". Retrieved 2008-04-15. ↑ "Witten SCORE-ing on and off the Field @JasonWitten". Retrieved February 19, 2016. ↑ "NFL Alumni Names Winners of 2010 Player of the Year Awards". NFL Alumni. 2011-02-05. Retrieved 2011-02-09. ↑ "Jason Witten Among Elite Tight Ends". ESPN. 2011-11-13. Retrieved 2011-11-13. ↑ Archer, Todd (August 16, 2012). "Jason Witten hopes to avoid surgery". ESPNDallas.com. Retrieved 2012-08-16. ↑ Archer, Todd (September 6, 2012). "Jason Witten has two catches in win". ESPNDallas.com. Retrieved 2012-09-06. ↑ "Jason Witten sets Cowboys' record". Retrieved February 19, 2016. ↑ "Record-breaking Jason Witten: 'You play to compete for championships'". Retrieved February 19, 2016. ↑ "Jason Witten sets receptions record". Retrieved February 19, 2016. ↑ "Jason Witten moves to No. 2 on all-time tight end receptions list - NFL - Sporting News". Sporting News. 2013-09-15. Retrieved 2013-09-16. ↑ George, Brandon (October 5, 2014). "Jason Witten joins Tony Gonzalez, Shannon Sharpe in exclusive club". Dallas Morning News. Retrieved October 5, 2014. ↑ "Jason Witten - Profile". NFL.com. Retrieved 2014-10-16. ↑ "TONY GONZALEZ'S LEGACY WILL CONTINUE IN ATLANTA". Atlanta Falcons.com. Retrieved 2014-10-16. ↑ Archer, Todd. "Jason Witten becomes 12th player, second TE with 1,000 catches". ESPN.com. Retrieved 11 December 2015. ↑ "Walter Payton NFL Man of the Year". nfl.com. ↑ "Dallas Cowboys Receiving Career Register". pro-football-reference.com. ↑ "Jason Witten Biography". Retrieved February 19, 2016. ↑ "Cowboys' Jason Witten and wife add bye-week baby to family". Retrieved February 19, 2016. ↑ "NFL Star Jason Witten on Life as a Dad and His (Growing) Family". Retrieved 3 December 2014. ↑ "Jason Witten I Am Second Testimony".